At the Association of the U.S. Army’s Global Force Symposium and Exposition in Huntsville, Ala., industry and the Army focused on the uncertain future. The three-day event of forums and exhibits had a singular focus of preventing the Army from becoming less than the biggest, “baddest” land force in the world. That is a possibility, senior officials warned at the AUSA Institute of Land Warfare professional development forum. 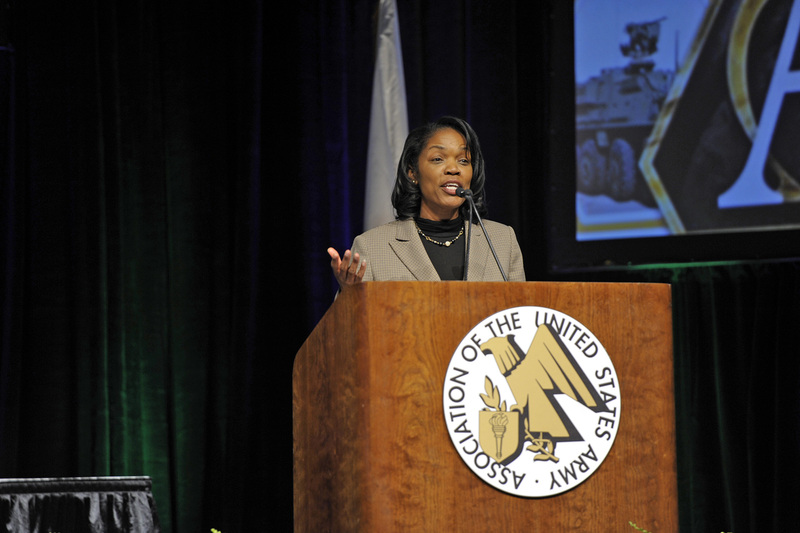 “We are on the verge of losing our global superiority,” said Steffanie B. Easter, acting assistant Army secretary for acquisition, logistics and technology. Easter said one of the benefits of the Global Force event at the Von Braun Center is the opportunity for collaboration. “I look forward to spending some time with you,” she said in her remarks to Army and industry attendees. Gen. David G. Perkins, commanding general, U.S. Army Training and Doctrine Command, said the Multi-Domain Battle discussion the Army has been having over the last year focuses on shaping concepts for the future Army that are aimed at creating “windows of domain superiority” against adversaries. With straight talk, the Army’s senior logistician challenged industry partners and his own workforce to help meet the demands of Army readiness. 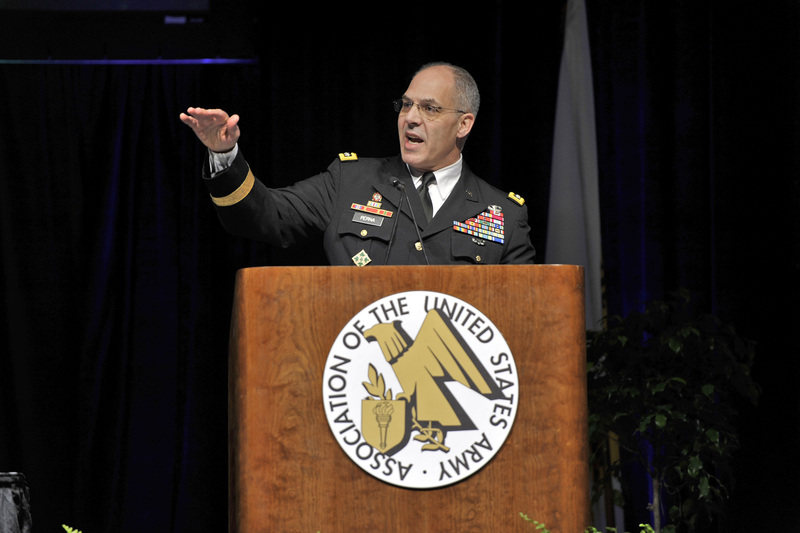 Gen. Gus Perna, commander, U.S. Army Materiel Command, described the challenges of a next war and warned of the potential atrocities that could hamper equipment delivery to a forward location. “Frankly, the challenges of tomorrow are nothing like we had yesterday,” he said. From a sunk ship to a disabled train, Perna noted the result could wipe out an entire brigade combat team’s worth of equipment. The Army is working toward that end, Perna said. For its part, he said the Army Materiel Command is doing its best to execute the mission. Perna challenged industry partners to be more judicious in filing contract protests and pledged adherence to the highest standards on the Army’s end. While the Army’s top leaders are focusing on readiness, modernization and challenging the status quo, Perna identified immediate actions the Army Materiel Command is undertaking to enhance readiness. Redistributing on-hand equipment is a top priority, Perna said. With 980,000 pieces of the right equipment in the wrong place, the Army Materiel Command is reallocating the items where they are needed most. At the same time, the command is divesting 1.3 million pieces of equipment that are no longer needed. Keeping the soldier confident in the Army’s equipment means ensuring supply availability so that repair parts are where they need to be, whether for training or on the battlefield. “We need to restructure our demand process and change the algorithm to meet future demand, not react to past demand,” he said. As Congress looks for ways to cut costs, Perna said he must be able to articulate how the Organic Industrial Base is connected to the Sustainable Readiness Model. Ensuring Army Prepositioned Stocks are properly configured for combat, maintaining science and technology capabilities and ensuring foreign military sales enable partner capabilities are also key to providing readiness, Perna said.